This article appeared in Business India, July 16-29, 2018. The industrial system – what we make, buy, and use – sits within a larger system of nature. This industrial system includes, amongst others, a wide range of products such as automobiles, TVs, laptops, mobiles, buildings, power plants, and so on. The natural world includes living regenerative resources, such as forests, croplands, and fisheries. These regenerative resources can sustain human activities indefinitely, provided we do not harvest them more than their ability to regenerate themselves. This same natural world also includes non-regenerative resources, such as oil, coal, and minerals. The non-regenerative resources can only be depleted or extracted. Since they cannot be replenished, many start to run out. Nations that own non-regenerative resources have muscle power. Think OPEC. In the process of extracting non-regenerative resources and harvesting regenerative resources for producing goods, as well as using goods, the industrial system generates waste. Even discarding waste generates waste! Over production and waste damage the natural systems. Think of the mountains of COPQ (Cost Of Poor Quality). The industrial system also sits within a larger social system of communities, families, schools, and culture. Over production and waste cause inequality, anxiety and stress in our societies. Industries are driven by expansion of production and employment. And for the past half century, growing consumption. This consumption includes tangible consumer goods such as smart phones and jeans; and services such as air travel and music / movie / book downloads. Both categories are produced by companies using their capital equipment and facilities. We have only focused on the system within a system. I call this Business Myopia. Concern for the health of the larger social and ecological system within which the industrial system sits has been confined largely to the back page, even though the public concern has been growing for more than a generation. In conclusion, we need the best brains in India to come together to examine whether, and if so at what social cost, there are any other paths to economic progress that are less energy-intensive, less polluting, and with less impact on Earth’s climate stability. QED. Mother Earth is the Ultimate Customer. We all know the consequences of Customer Rebellion. Excellent Suresh, and so relevant in this time of global heat waves. Loved the “whale and daughter analogy”, which illustrates how one has just to find the right button to press – or, better still, heartstrings to play – to get things to work. And, if each country just concentrated on how to improve their own approaches to wastage, etc. 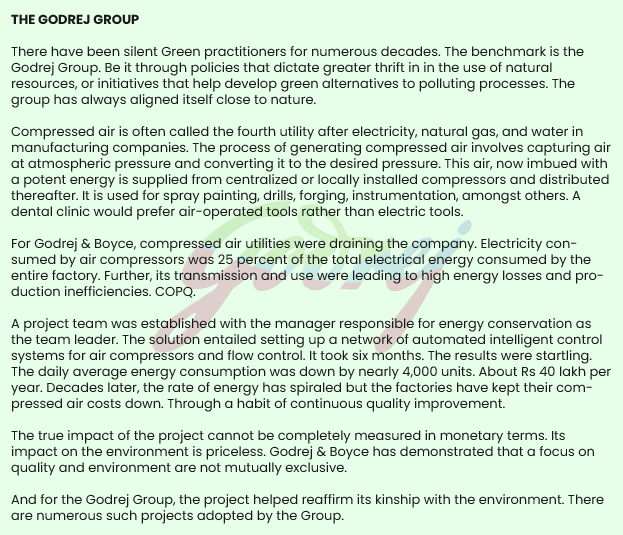 (like Godrej) imagine the impact on the world situation. Here in the UK at present, there is a campaign against the indiscriminate use of plastic. People now have to pay 5p for each plastic bag from the supermarkets and this has reduced the demand greatly – people reuse their old bags again and again. Some shops have started supplying paper straws instead of plastic ones and coffee shops are selling reusable coffee mugs etc. Some folk won’t buy vegetables wrapped in plastic etc. There is still a very long way to go but at least it is a start. And public awareness is vital. But what you said about waste – and waste creating waste – is so true. I won’t go on – it will be preaching to the converted! – so I will say bye for now. Keep on writing, you have a gift and I so admire your enthusiasm. All power to your elbow, as they say!!! Thanks for the encouragement, Jill. Its been a long time since I heard Äll power to your elbow! Very comprehensive Column on a very important topic. Illustrations from Tata & Godrej are superb. Thank you Mr Chandra Mohan. Do you have any benchmarks in North India? A wonderful narrative to preserve nature. The irony is that we forget that we are also Nature’s offspring and tend to treat other creations with predatory instinct. A delightful contribution. Thoroughly enjoyed reading the contents. Outstanding by any standard. As always, reflects your wisdom. Very aptly said that the focus on Quality and environment is not mutually exclusive. We are a part of nature and not outside of it. Business growth should not be at the cost of environment but must take environment into consideration. In the long run constant exploitation of nature and it’s resources is only going to harm us. The Quality fables are very apt and make home the point. Thank you for your appreciation. The iceberg of this problem requires that Human Safety be added to Quality and Environment. Any thoughts? Fantastically penned…. wow love the title and concept. Our myopic approach to life (and management) will take us to where we are heading! BANG. Thanks for sharing….This is one of the most holistic article I have read in my 25 years of career…amazing! Sir this is truely inspiring!!! Such core values conveyed so easily in a very simple language!!! Brilliant read Uncle Suresh! Loved it! Thank you for sharing it. Will share it with some of my friends! You are transforming from Quality to Sustainability. 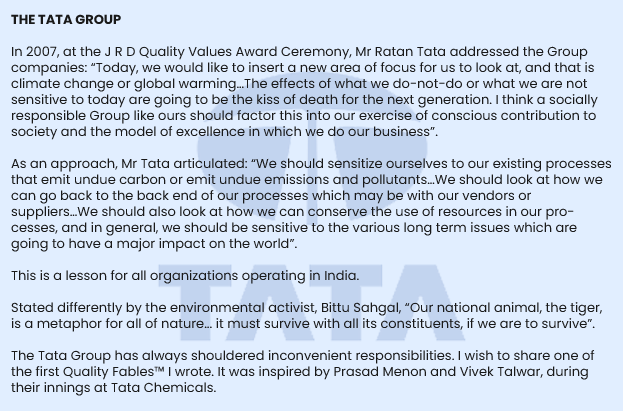 The examples of Ratan Tata, Tata chemicals and Godrej are really apt. Thanks for sharing your words of wisdom. Quality is no longer a choice. Organizations seem to think Sustainability is a choice. Watch out for 2020. I love the way you tell this story. The big issue upfront. The stories of how it can be done and ending with an appeal of “rebellion” by Mother Nature. It touches a chord and makes you think! Well I shudder to think what can happen if a customer who loves like a “mother” decides to rebel where would that leave us! A concept that touches you but also makes you sit up and take notice! Thank you Mr Lulla! I have sent the article across to my friends and colleagues! Save my details in this browser. Suresh Lulla on NOT Ready. Fire. Aim…BUT Ready. Aim. Fire. Parimal Parmar on NOT Ready. Fire. Aim…BUT Ready. Aim. Fire.